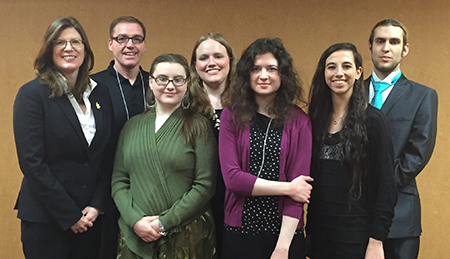 The Cowley College Phi Theta Kappa chapter, Alpha Gamma Upsilon, recently attended the Kansas- Nebraska Region Convention in Manhattan, KS, March 4-6. For the second year in a row, Cowley College’s chapter finished in first place in the Honors in Action research projects about allowing guns on campus and in the College Project which attempted to determine the underlying causes of underperforming populations of students. PTK advisor Deborah Layton said regional first place finishes allow the chapter to be considered for international awards. Other regional awards earned included Distinguished Recognition as Outstanding Chapter Award, 5-Star Chapter Award, Honorable Mention for Distinguished Member Award went to Aishah Alhomsi, Honorable Mention for Achievement in Art – Ceramics/Sculpture also went to Aishah Alhomsi, while Honorable Mention for Achievement in Literature Award was awarded to Arnoldo Ruiz. The students participated in breakout sessions including Five Star Chapter and Member Programs, International events information, College Project presentation and membership recruitment strategies. The Cowley College chapter also contributed to the Alumni Association’s Service project, donating clothing items for a local homeless shelter. "I enjoyed the conference and was able to see the many benefits of joining Phi Theta Kappa, such as scholarships and leadership opportunities,” Tabitha Slater, PTK vice president at Cowley’s Mulvane Center said. “We were also able to see the installation of the new regional officers which was an exciting experience. I was really happy that Cowley College was awarded the highest place for both our Honors and Action Project and the College Project, and I am proud and grateful for all the hard work the officers and members put into the projects." Keynote speakers presented for each general session on several topics. Devin Henderson, Humorist/mentalist, encouraged that each person is a “magician,” but that individual magic is different for all. Kevin Blackwell provided an overview of the themes in next year’s Honors in Action study topic. Dr. Lynn Tincher-Ladner, the CEO of Phi Theta Kappa, provided an update from the national office and had an open discussion with region members. While, Renee Gregory oversaw the interpretation of Strengths Quest results which identified five key attributes or leadership qualities of each participant. Representatives from Cowley College were advisors Tiffany Corley and Scott Layton and students Aishah Alhomsi, Keely Rocha, Tabitha Slater, and Joey White. Former PTK advisor Melinda Neal served as a sponsor during the implementation and writing sections of the projects. Keely Rocha is a new member in Phi Theta Kappa this semester. She is a recent graduate of Mulvane High School and attends Cowley’s Mulvane Center.